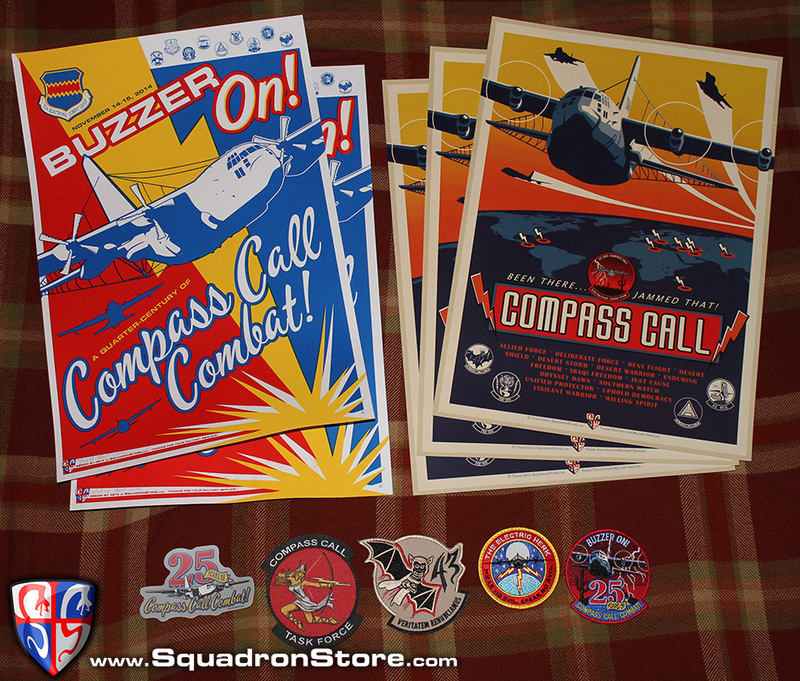 Squadron Store usually deals only in bulk orders for military units and defense industry clients - but requests from veterans, families and enthusiasts have encouraged the release of some products to the general public. Because Squadron Store does not generally service individuals or sell individual products, a ‘collection’ has been put together. Hopefully, those who order will either gift or sell their extras to other interested parties, possibly even recouping their initial investment. Act fast, only 8 of these collections are available. 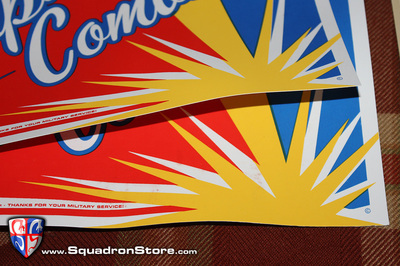 Customers who may be interested in bulk ordering individual products (10 or more) may contact us through www.SquadronStore.com to see if the desired design is in stock. 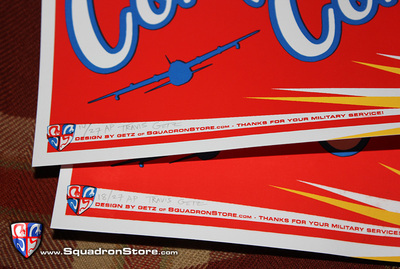 Current squadron members should contact their Booster Club rep or SNACKO to request larger bulk orders at a reduced cost. Questions may be submitted via the Squadron Store contact form. 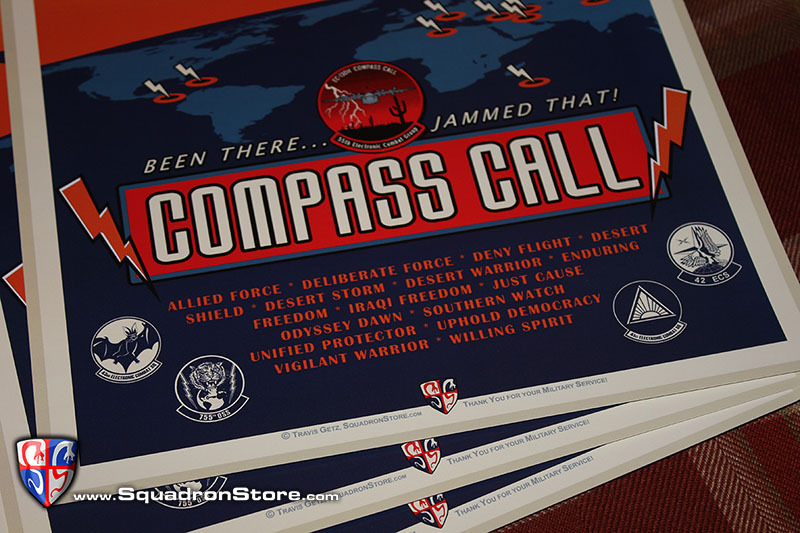 Squadron Store was commissioned to design and deliver these in 2014 by the team organizing the events honoring 25 years of Compass Call involvement in combat missions. The main edition was sold to event attendees. These prints are custom silk screen fine art pieces on heavy paper. They are individually signed and numbered 'Artist's Proofs' meaning that when the order was prepped for the event, these were pulled due to very minor imperfections (most people would never even notice them) so the Airmen would get the best products possible. Artist's proofs are considered by some to be more valuable as the edition is fewer in number than the main edition and from the artist's personal stock. The colors are magnificent and difficult to capture in a digital photo. An image is included contrasting how it looks with and without the camera flash on to try and give a better idea to customers. Prints are 12 x 18 inches and can be custom framed or put into an 'off the shelf' frame as it is a common size. 55th ECG Command commissioned this design to appear next to the aircraft during static displays at air shows and for VIP visits. The official ‘Air Show’ display version is 24 x 36 inches. This is a digitally printed design. The posters are unsigned and not numbered. They measure 12 x 17.25 inches. This is not a common size, but frames in these dimensions can be ordered online if you do not wish to custom frame. This sticker is digitally printed on vinyl, and UV coated for outdoor use if desired. The “Buzzer On” 25 Years of Compass Call anniversary patch is an updated take on the old 55th ECG ‘Red Ball’ patch. 3.5 inches tall, Velcro backed, embroidered patch. The Electric Herk “Hear No Evil, See No Evil” patch was commissioned for wear on aircrew flight suit shoulders. 3 inches tall, Velcro backed, embroidered patch. 43rd “Veritatem Renunciamus” Heritage Patch. This is a re-work of an old historical design that saw service with the Bats of the 43rd ECS. 4 inches tall, Velcro backed, embroidered patch. The ‘infamous Electra’ Getz Girl patch. Getz Girls are Squadron Store’s line of tasteful ‘command and family-safe’ pin up designs. This patch was designed to honor the men and women of Compass Call and booster club plans were to sell it at an air show. It received command approval for sale and uniform wear during special events so an order was placed. 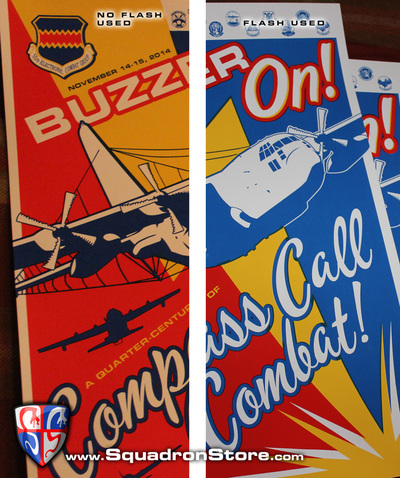 The design was posted to the Compass Call Alumni Facebook page by a member of an Electronic Combat Squadron. The result was someone complaining to higher ups within the group who had the patch banned for use on Airmen’s uniforms. Funny how things happen… the result was the booster club selling out of their stock immediately! Fortunately, some additional patches were created when placing the main order (this is a common practice; extra patches have to be made to account for possible errors or for production samples). Little chance more will be made since the booster club cannot sell them anymore so get yours now… Created as a woven (more expensive) patch to capture all the fine detail. 4.25 inches tall, Velcro backed. 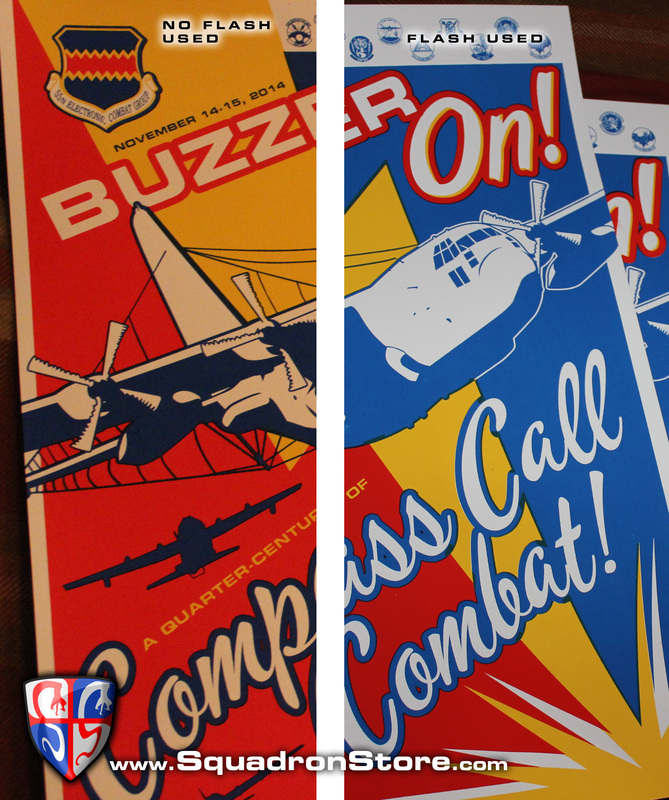 IMPORTANT: Both "25 Years of Compass Call Combat" posters feature slight 'rippling' in the lower right corner because they were exposed to moisture (send me a message if you want the full, dramatic story). They have been completely dried out and are now undergoing further 'pressing' in a final attempt to flatten them out and should frame up fine. One poster is a 'top quality' artist's proof, the other may be slightly lower quality (but most people can't tell the difference at more than 4 feet away). SHIPPING: Price includes packing and shipping via US Postal Service Priority mail within the Continental United States (CONUS). Items will be delivered inside a strong triangle-tube mailer. Insurance is included. 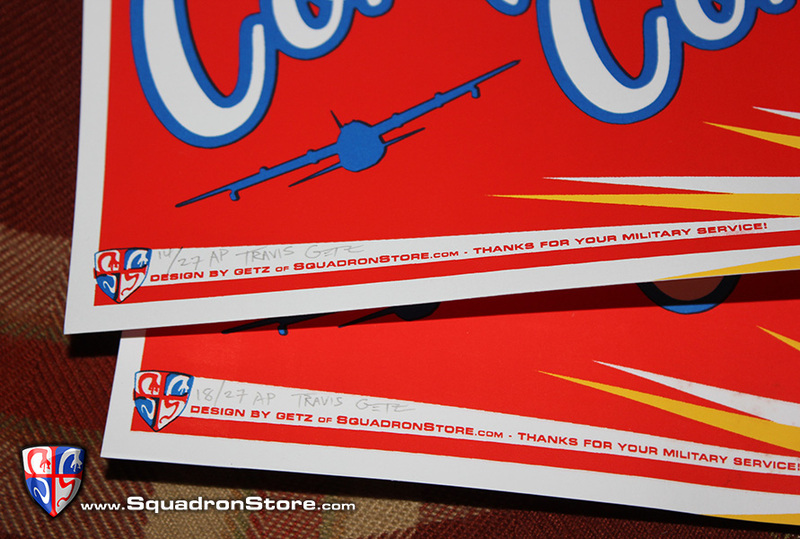 If you are outside CONUS, have the order shipped to a CONUS friend for them to forward them to you, or contact Squadron Store for additional pricing. Purchases made by December 18, 2014 should arrive in time for Christmas within CONUS. PERSONALIZATION: Yes, the print and poster designs can be personalized by the artist according to your wishes at no additional charge. However, if personalized items are included in the order, no returns are possible. RETURNS: You should be 100% satisfied with your order. 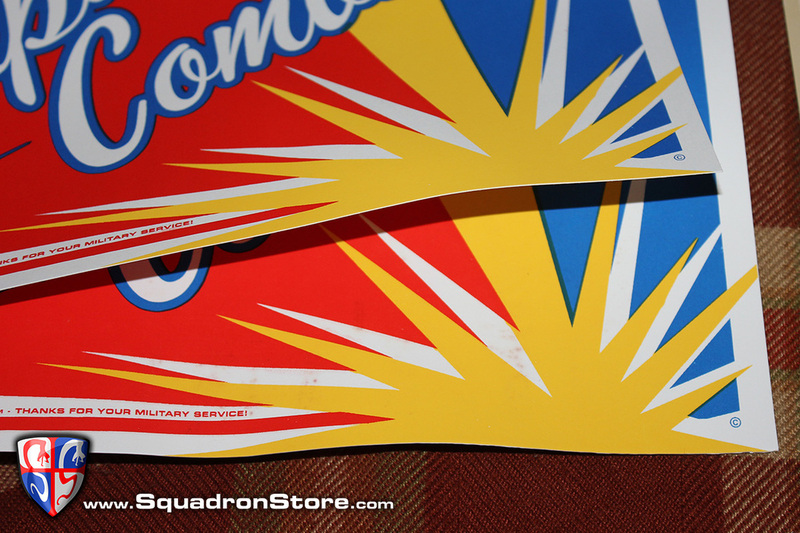 Squadron Store will refund any orders, provided you return the items and cover return shipping/insurance. Please be sure you’ve read all the information above (particularly about the ‘ripple’ in the silk screened prints and the nature of an ‘artist’s proof’). All products posted for sale to the general public in the Squadron Store shop are accompanied by a donation to a military philanthropy associated with the featured service branch. If you or yours have served our country, thank you for your dedication and sacrifices! SET SOLD OUT!!! BUT INDIVIDUAL PIECES MAY BE SOLD IN THE FUTURE - FOLLOW US ON FACEBOOK TO HEAR ABOUT THAT...SOLD OUT!! !